ISLAMABAD, Aug 3 (APP): The Envoys Conference will act as a catalyst for ambassadors to pursue foreign policy featuring economic diplomacy as an important component, and highlight Kashmir issue in an intensified manner, envoys said here Wednesday. 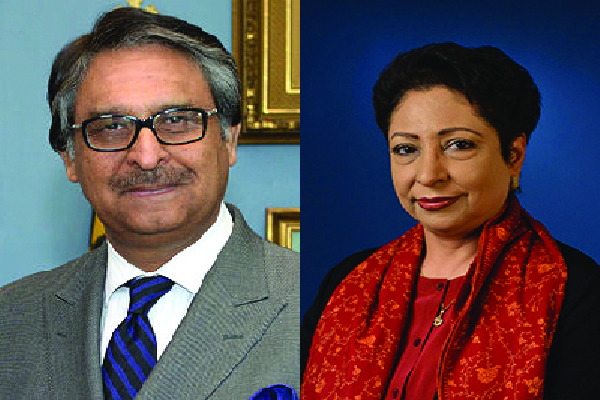 The views were expressed by Ambassador to United States Jalil Abbas Jilani, Ambassador to China Masood Khalid and Pakistan’s Permanent Representative to the United Nations Dr. Maleeha Lodhi in their interaction with APP here at the conclusion of Envoys Conference. The three-day Conference, convened by Prime Minister Muhammad Nawaz Sharif, was attended by Pakistan’s envoys deputed at nine stations including Washington, Beijing, New Delhi, Afghanistan, UN New York, UN Geneva, Vienna, Brussels and Moscow. Prime Minister Nawaz Sharif also presided over the concluding session of the Envoys Conference. provided the country’s ambassadors an opportunity to divulge upon the current challenges and the requisite policy to address these. The Prime Minister has urged upon the envoys in attendance to intensify economic diplomacy for the benefit of country, he said. On Kashmir issue, Jilani said the Conference stressed for continued moral, diplomatic and political support to the Kashmiris for their demand to self-determination. He said the Prime Minister directed envoys to highlight in their respective countries the human rights violations by Indian security forces using pellet guns on Kashmiri civilians and causing them blindness. He dismissed the impression that Pakistan was getting isolated at diplomatic scene, rather, he said its efforts in ensuring regional stability had been acknowledged by many strategically important countries. He mentioned that Senator John Mccain during his recent visit to North Waziristan clearly appreciated Pakistan’s effective role in counter-terrorism. Jilani said Pakistan’s relations with the Untied States held immense importance in economic and defence fields, and should not always be perceived in the realm of U.S financial assistance only. Pakistan’s Permanent Representative to UN Dr. Maleeha Lodhi told APP that the Envoys Conference acquired special importance in view of the Prime Minister’s directives to take stock of the current situation. She said Kashmir remained top agenda of the Conference in view of the indigenous Kashmir uprising in the backdrop. Dr. Lodhi said in line with the Prime Minister’s directive, she would step-up diplomatic campaign to highlight human rights violations in Kashmir at the important global forum UN. She said the resolution of Kashmir dispute lied in peaceful negotiations between Pakistan and India. Holding of Conference is a timely lead taken by the Prime Minister for evaluation of the fast geo-political shift and its relevance to Pakistan, she added. She said critical issues in Pakistan’s foreign policy were reviewed and the Prime Minister listened to the collective recommendations of the envoys at the meeting. Ambassador to China Masood Khalid said the Conference also focused on Pakistan’s multi-dimensional relations with strategically important China, particularly in view of progress over the China Pakistan Economic Corridor. He said the meeting also emphasized on timely completion of CPEC-related projects including a section of Korakorum Highway, Karachi-Lahore motorway and Gwadar International Airport.